Welcome to Olde-Tyme Supply, Inc.
Olde-Tyme Supply carries a wide variety of landscaping supplies. We are a Unilock dealer serving the Midwest and Chicagoland area. Some of our products include Unilock pavers and Unilock retaining walls, erosion control blankets, fertilizer, grass seed, drainage tile products, landscape fabricate, lawn and brick edging, brick tools and much more. Let us help you decide what products will work best for your landscaping project. Call us to day at 1.708.258.4400. Unilock carries the most beautiful Unilock pavers and decorative concrete Unilock retaining walls for your landscaping project. Are you looking for a new BBQ area, a decorative winding driveway, a new sidewalk that will make the neighbors take notice, or maybe a lovely new sidewalk that will pave the way to your new rose garden? 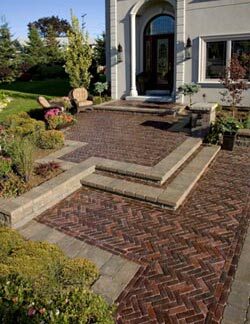 Olde-Tyme Supply, Inc will provde just the right pavers, walls systems and landscaping supplies to fit the bill. We are an authorized dealer of Unilock. We service the Chicagoland area and the Midwest. Whether you are landscaper, contractor or homeowner, we would like to discuss your landscaping needs.